Immerse in ice bath for 20 minutes to soften bitterness. Reduce in sauté pan over low-medium heat to syrupy consistency. Let cool. In a large saucepan, melt butter and add onion, bay leaf and herbs. Sweat onions with herbs until sweet and translucent. Add mushrooms and sauté for 10 minutes over medium heat. Add rice and sauté for 2 more minutes. Add white wine and cook out alcohol. Cooking at medium heat, add hot stock 4 ounces at a time, stirring constantly for 15 minutes or until rice is soft with a firm middle. Add mushrooms and peas, and season to taste with salt and pepper. Cook for 5 more minutes. Finish with Parmesan. Pat dry the radicchio leaves. 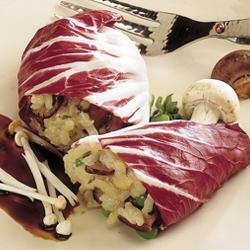 Lay them out flat and fill with mushroom risotto, then roll up like a burrito. Place fold side down on a plate and drizzle with balsamic syrup. Garnish with enoki mushrooms. Makes 8 wraps.